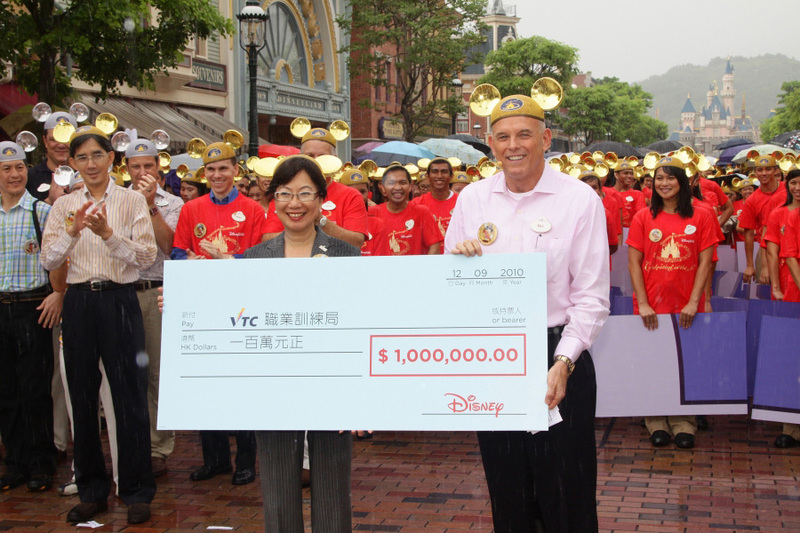 "Bill Ernest, President and Managing Director, Asia for Walt Disney Parks and Resorts presented a gift from the Walt Disney Company of one million Hong Kong dollars as a scholarship grant to the Vocational Training Council of Hong Kong." 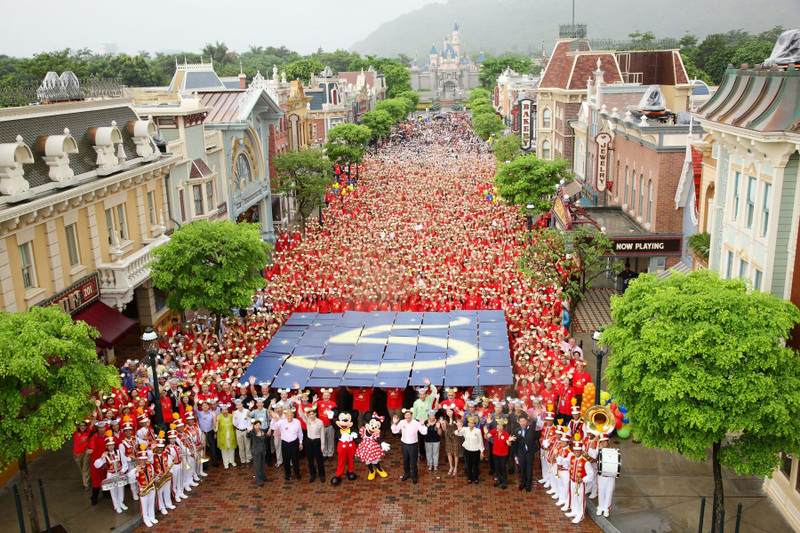 (Hong Kong, 12 September 2010)Today marks the 5th Anniversary of Hong Kong Disneyland Resort. In celebration of this important milestone, more than 4,000 people including President and Managing Director (Asia) for Walt Disney Parks and Resorts Bill Ernest, Hong Kong Disneyland Resort Managing Director Andrew Kam, partners from the community, guests from the tourism industry and the Resort’s Cast Members gathered on Main Street U.S.A and took part in a photo-taking event. On this special day, Hong Kong Disneyland Resort was delighted to announce that The Walt Disney Company will donate HK$1 million in a scholarship fund to be awarded to 100 students studying hotel and tourism, and design under the Vocational Training Council. VIPs attending the celebration include Mr. Philip Yung, Commissioner for Tourism; Ms Chau Chuen-heung, the Vice-Chairperson of the Islands District Council; Ms Ho Yuen-ha, Hong Kong Police Force Lantau District Commander and Dr Carrie Willis, Executive Director of Vocational Training Council. “Hong Kong Disneyland is committed to nurturing talent in order to contribute to the establishment of Hong Kong as a key tourism and creativity centre. We thank The Walt Disney Company for their generous support which will be instrumental in inspiring students to dream, create and make a difference in the world,” said Andrew Kam, Managing Director of Hong Kong Disneyland Resort. “The Vocational Training Council is honored to receive Hong Kong Disneyland’s kind generosity in offering these scholarships to our students. Hong Kong Disneyland Resort has long been our industry partner providing invaluable learning opportunities to our students through the various programs such as student attachments and graduate placements as well as the frequent sharing sessions between staff and students. We are all excited about the news and very much look forward to working closer with Hong Kong Disneyland on many levels to nurture our next generation,” said Dr Carrie Willis, Executive Director of Vocational Training Council expressing her heartfelt gratitude to Hong Kong Disneyland Resort. A 15-year-old secondary school student, Dallas Lam, who has been to the Park more than 500 times, attended today’s anniversary celebration and presented a handmade golden castle to the Park as an anniversary gift. “My parents always encourage me to visit the park so that I can get a break from my school work. Last summer, I visited the park and watched the firework show almost every day. I am delighted and excited every time I come to Hong Kong Disneyland.” said Lam, who has made friends with over 60 Cast Members. To develop a deeper understanding of its Guests, Hong Kong Disneyland Resort commissioned an independent market research company to conduct an interview of 1,000-plus Hong Kong residents aged 18 to 54. 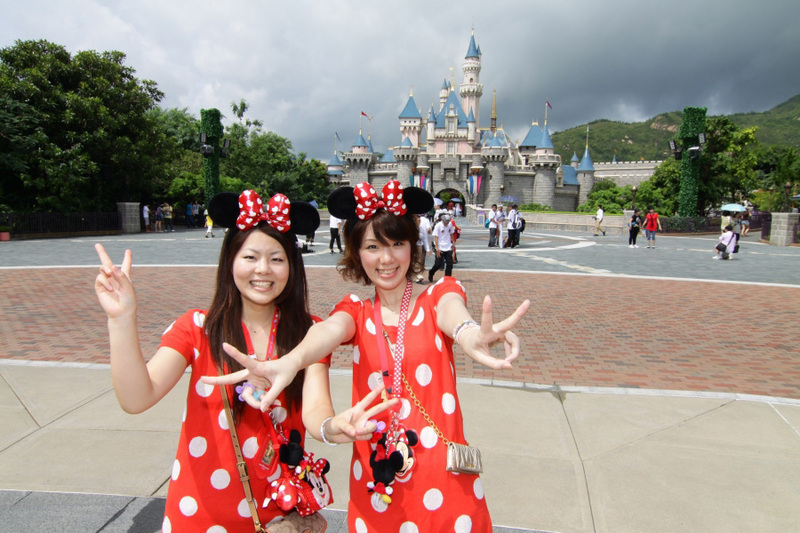 The survey indicates that two-thirds of respondents have visited Hong Kong Disneyland since its opening in 2005 while on average, these respondents have visited the Park about three times. Among the rides, attractions and entertainment shows at Hong Kong Disneyland, Space Mountain at Tomorrowland was chosen as the best attraction for immersing respondents in the Disney stories, followed by “Disney in the Stars” Fireworks and Disney on Parade because of its happy atmospheric experience. As one of the major theme parks in Asia, Hong Kong Disneyland Resort organizes a wide variety of celebrations during key festive seasons. About 40% of respondents would recommend “A Sparkling Christmas” to their overseas friends, as it enables them to enjoy a unique, glittering, and traditional ‘snowy’ Christmas in Hong Kong. About 30% of respondents would recommend the Chinese New Year celebrations as the festive decorations can successfully immerse them in this delightful season, as well as bringing them the best of good luck for the Lunar New Year. 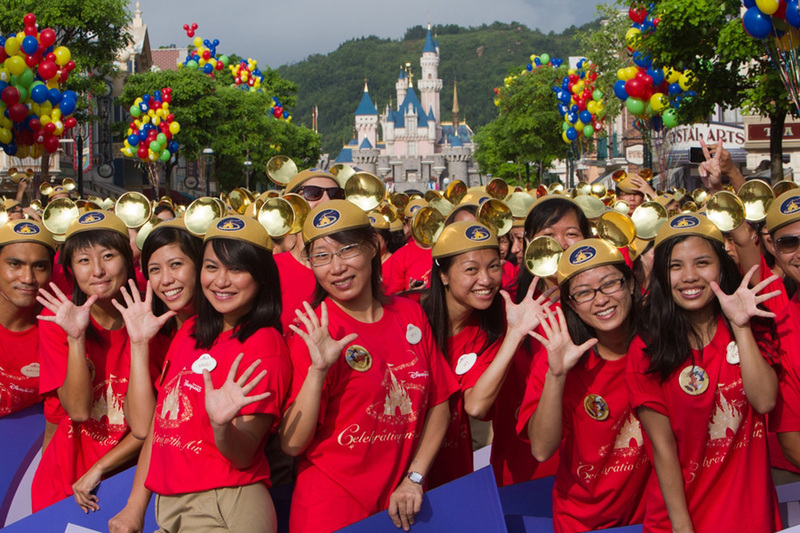 Disney characters are the heart and soul of Hong Kong Disneyland Resort. According to the survey, about 30% of the respondents would like the next generation to possess the positive and optimistic personality of Mickey and Minnie, followed by Lion King Simba’s courage and sense of responsibility. In addition, students and respondents aged between 18 to 34 would like to cherish friendships likeToy Story’s Woody and Buzz Lightyear. Nearly 40% of the respondents would choose being able to participate in launching “Disney in the Star” Firework as the most memorable moment, followed by attending Grand Marshal for the “Disney on Parade” and Cast Members singing a birthday song for birthday celebration. When asked about which celebrity they would like to be with for the chosen magical moment, the most popular choice is Jacky Cheung Hok-yau. The next most popular celebrities are Andy Lau Tak-wah and Eason Chan Yik-shun. On the other hand, about 40% of respondents would Lau Tak-wah and Eason Chan Yik-shun. On the other hand, about 40% of respondents would like to share magical moments and memories at Disney with their significant half. Since its opening, Hong Kong Disneyland Resort has been dedicated to serving the local community, particularly in the following areas: Children and Families, Environmental Conservation, as well as Volunteerism. 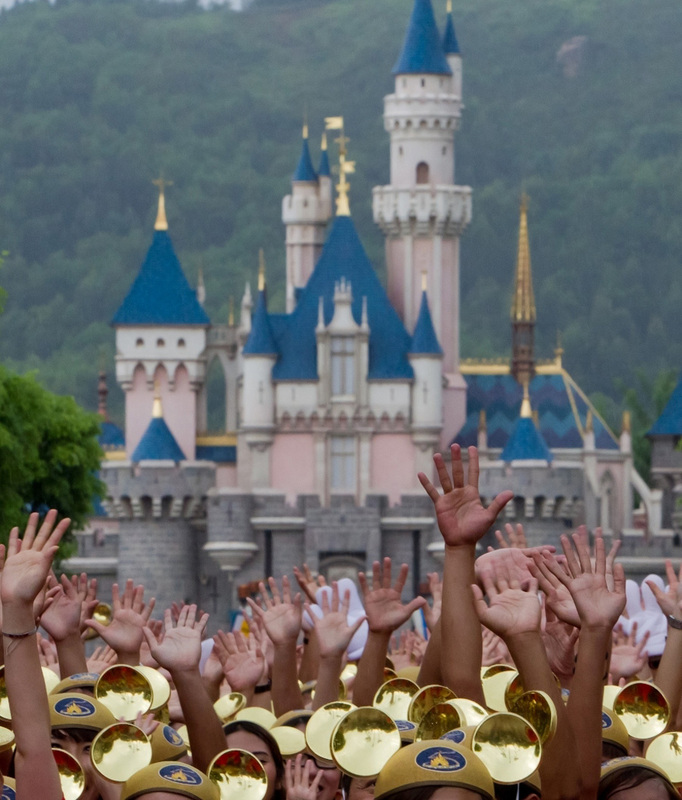 Hong Kong Disneyland Resort will continue to listen to the Hong Kong people and take an active role in local community activities, especially in areas which the Hong Kong people champion such as Environmental Conservation, Youth Development and Children Development. 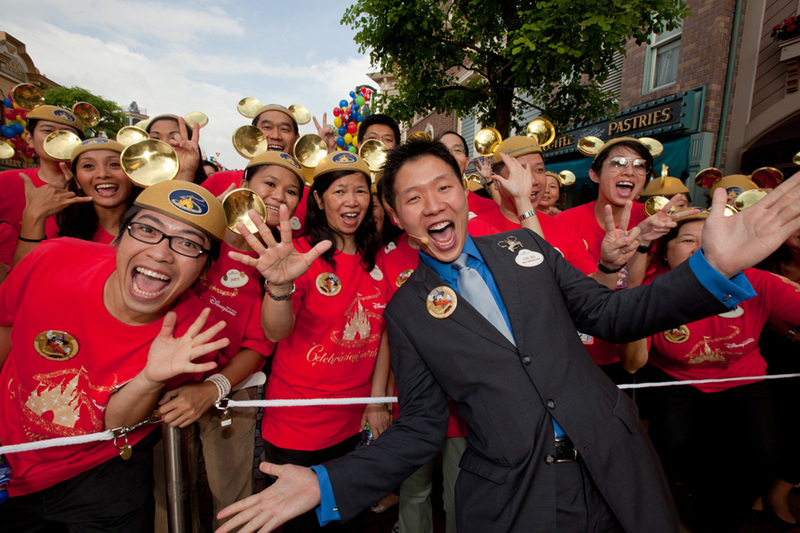 The 5th Anniversary marks an important milestone for Hong Kong Disneyland Resort. From September 2010 onwards, the Resort will bring more surprises and unique Disney experiences to our Guests from Hong Kong and around the world. Hong Kong Disneyland Resort offers immersive, unique Disney experiences for all families, generations and ages to enjoy. Hong Kong is one of only five locations in the world that is home to a Disney themed park and the many Disney characters that are beloved the world over, such as Mickey, Minnie, Donald, Stitch and Buzz Lightyear. Since the Resort was opened in September 2005, it has received over 20 million Guests from around the globe. Through the unique product offering and the world-class service provided by the 5,000-strong Cast at the theme park and the two hotels, the Resort has received outstanding Guest satisfaction ratings and a range of awards from the hospitality and entertainment sectors. 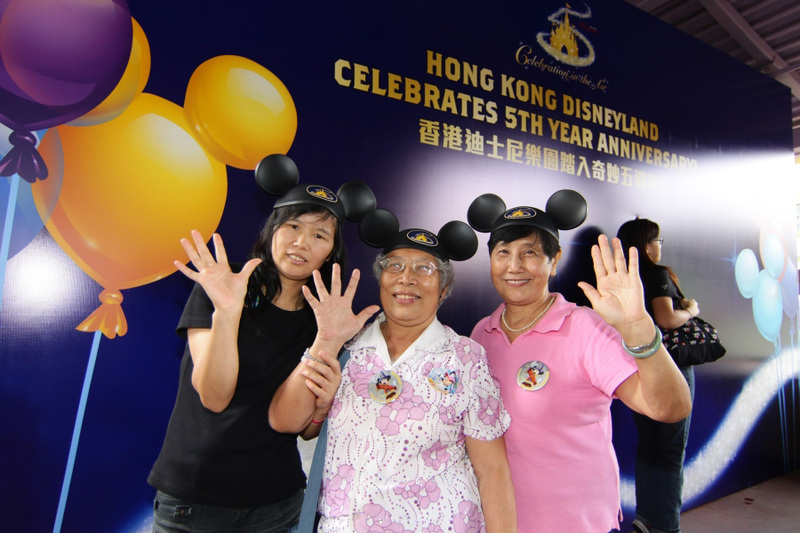 Hong Kong Disneyland is dedicated to serving Hong Kong people through a wide spectrum of community services programs from helping those in need to encouraging the protection of the environment in the region.